AlNiCo magnets are made of Aluminium, Nickel, Cobalt en Ferro. 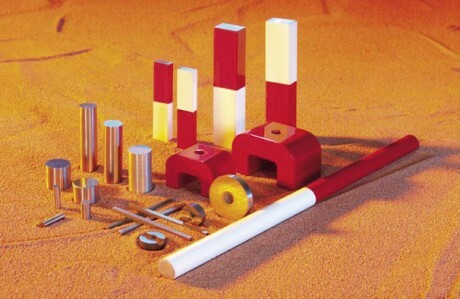 Most AlNiCo magnets are cast, whereby the alloy is cast in a sand form in liquid state at very high temperatures. This can take place in complex forms, such as for example the form of a horseshoe. Some versions are pressed and sintered. The magnetic characteristics are then somewhat lower, but the magnetic characteristics are then actually better. To prevent demagnetisation the correct length/diameter proportion must be maintained. Cast or sintered material from aluminium-nickel-cobalt. Temperature range: -270 °C to +450 °C. Machine with diamond or carborundum tools. Choose L / D ratio if possible> 5; do not position the magnets in repulsive order; if possible magnetise within the system.